OUTFOX recommends this First Aid Kit because of the variety of items and its applicability to multiple organizations. A good hygiene lesson can be constructed by reviewing each item with the class and by showing them how to use each item. Being prepared is an important part of every infection control program. 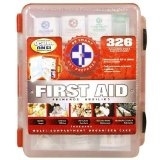 First aid kits are perfect for placement in cars, campers, work vehicles, homes, organizations and many other areas. The variety of contents in a first aid kit will make sure your school or other organization is prepared if there arises a need to use. Contents include bandages, gauze, antiseptics, etc. Keeping your organization stocked with the appropriate first aid supplies is one of the first steps to a successful infection control program. For a hygiene lesson, have your students build a first aid kit by having them name the contents as they put the packet together. To build a first aid kit with your students, you can give them a list to either get a kit for the class/organization or get a personal kit (for home, auto or another area). A good exercise is to sit down and brainstorm with students/employees to determine the most appropriate items and their quantities for the school/organization. This first aid kit is most useful to organizations with more intense needs in terms of injury prevention and infection control. Most organizations may not need such a large kit, but it is better to be over-prepared. Hang this first aid kit in a break room, safety zone or another area that can be accessed by all employees. First aid kits are used to mitigate the effects an accident or incident and should not be a company’s entire risk management plan in the event of an emergency. It is better to prepare the company rather than relying on disaster relief. Most organizations or departments will fit within this size of first aid kit. Make sure to keep the kit stocked as it is used over time. Many of the most used items include, but not limited to, bandages, pain relief pills, etc. An effective follow up lesson for hygiene and infection control would be to have the students take inventory of what items were used, analyze why, and then restock with the appropriate medical supplies. Discuss each item as you pull it out. Why is it included in the first aid kit? How does it work? What is the main benefit of having the item (gloves, pain relievers, gauze, bandaids, antiseptic creams, etc.) stocked consistently. You won’t go wrong by using a first aid kit that is approved by OSHA. For a hygiene or infection control program, familiarize the students with the contents and have them personally use the contents for training if possible. OSHA is a trusted organization that has been keeping millions of individuals safe over the years and does not allow low quality products to carry its name. It would be beneficial to have a lesson on OSHA and how they can partner with organizations. In terms of the first aid kit, conducting a company or class training will be beneficial for the future because everyone will know how to use the various items in the event of an emergency or accident. Although the trauma bag may be more intense than the needs of most organizations, it is OUTFOX’s recommendation to over stock or over-prepare rather than under-prepare. A good hygiene or infection control program could consist of using a trauma bag during a disaster or emergency drill. Since it may have more items than a normal first aid kit, it may be necessary to conduct a training on how to use each item that is contain in the Trauma Bag. Taking each item out at a time, taking inventory and discussing the use can help each student or employee have confidence if something disastrous happens. Many problems that occur in a disaster come from the lack or misuse of first aid items.